Caroline sent out a last-minute email to friends to accompany her on a sleigh pass to SantaCon. I have to admit, it was one of those once-in-a-lifetime experiences I just had to see for myself. If you’ve only read on blogs or heard on Japanese gameshows about mob pranks before then maybe you’re crazy enough to ever have wanted to be a part of the crowd. Just to see. We started out on the East Side and the East Side we’d stay. If you’re going to fill 5 yellow school buses full of Santas chanting “Ho. … Ho. .. Ho. Ho ho ho ho hooo!” then streets better be wide enough to handle the obstruction. And that’s not even including the few dozen Midnight Ridazz Santas on their trikes beating us to each location. El Cid and 4100 bar near Sunset Junction were good first stops (or maybe that was the liquor store) with bartenders prepped and ready to tend to our afternoon habit. I didn’t last all day. Okay, okay – I didn’t even last til late afternoon. My excuse was my company holiday party, but I was secretly glad to have it as an out. I missed out on uWink bar (:\) and Power House at Hollywood & Highland, Boardner’s and Jumbo’s Clown Room – with even an “after-party” at The Echo. Apparently, I also missed out on a concocted “snowball” fight outside the first location. But I was honored to have been part of this mob, if even for only a little bit. Other than the lagging at the beginning for a straggling fifth sleigh, the experience didn’t disappoint. This is a recommended pub crawl that you should do – at least once. Check the nearest, upcoming Santacrawls here. 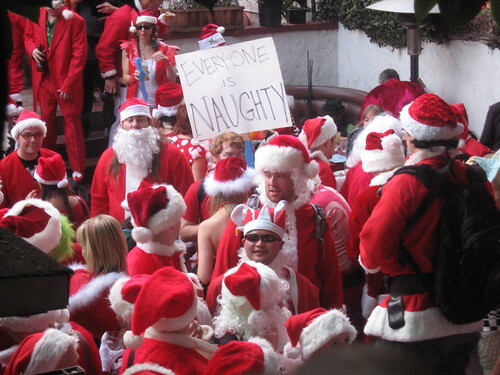 This entry was posted in Femme, Food, Silver Lake and tagged Echo Park, lasantacon, los angeles, pub crawl, santacon, Silver Lake. Bookmark the permalink.